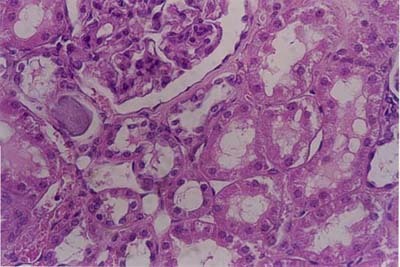 On a histology slide, the kidney can be identified by the presence of the renal corpuscle and kidney tubules. The tubules are lined by simple cuboidal epithelium (6). The renal corpuscle is surrounded by Bowman's capsule. The parietal layer of Bowman's capsule is simple squamous epithelium. A urinary space (which appears as a clear space) is visible on these histology slides: (2), (3), (4), (7). The glomerulus is a tuft of capillaries which appears a large cellular mass.